At I-10 exit 1, Ehrenberg lies right at the west edge of Arizona, on the banks of the Colorado River, 4 miles from the larger town of Blythe in California. The land adjoining the river is irrigated, and agricultural, but to the east stretch vast desert plains, completely undeveloped. Quiet, scenic backroads head both ways along the river; north to Parker, through the Colorado River Indian Reservation, and south (unpaved) to Cibola. Along with nearby Quartzsite, the town makes a good base from which to explore the western deserts, popular areas including Kofa National Wildlife Refuge, 50 miles south along US 95. Ehrenberg has few facilities apart from the travel center, motel and restaurant beside the interstate exit; the town itself is just to the north, and includes a large RV site overlooking the river, a small number of private residences, and another restaurant. 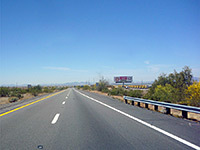 Ehrenberg provides a useful stopping point for people traveling across Arizona on interstate 10 - the town is 244 miles from Los Angeles and 142 miles from Phoenix. Best Western Desert Oasis (once known as the Flying J Motel) of Ehrenberg is right next to exit 1 of I-10, on the S Frontage Road, and overlooks undeveloped desert to the south. Ehrenberg itself is just the other side of the interstate, the Colorado River is half a mile west, and the larger town of Blythe in California is 4 miles away.